Renee, how nice to hear from you again. These pictures are from Germany, but we’re rather close to Austria. We just haven’t yet gotten over there on this trip! Hopefully in the summer months. I liked reading your thoughts on winter. 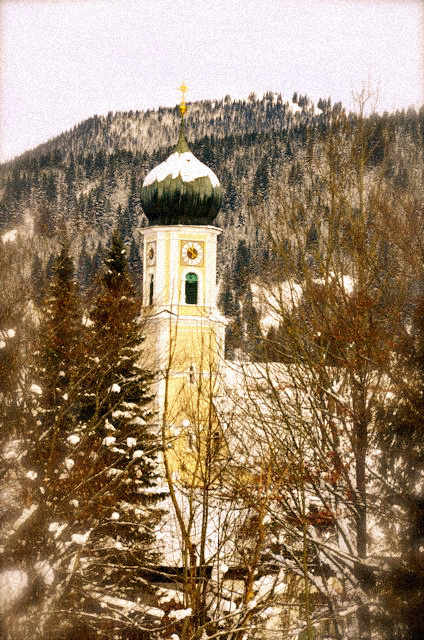 Oberammergau – or another mountain village – is the perfect place to engage in that reflective thought that you mentioned. I must confess that despite its cutesy elements, I love spring. I cannot wait to go hiking here among the green mountains in a few months. I’ll have to pop on over to your site and read up on Winslow. 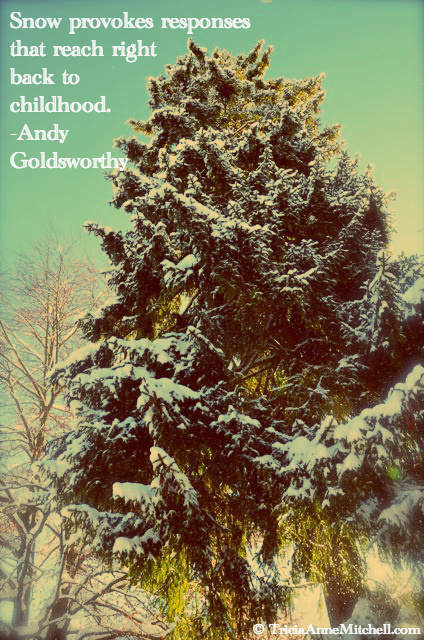 Wonderful quotes, magical photographs. Winter in the southern US can run from balmy to frigid, so we often spend a lot of time outdoors – at the slightest hint of cold weather I stay inside as though its an arctic blast! I’m with you on hibernating when it’s cold outside! (You’d think as someone raised in the Midwestern US that I’d be a snow bunny, but slightly warmer climes have spoiled me. ( I used to ski as a child, but skiing of the downhill sort is no longer quite as enticing. 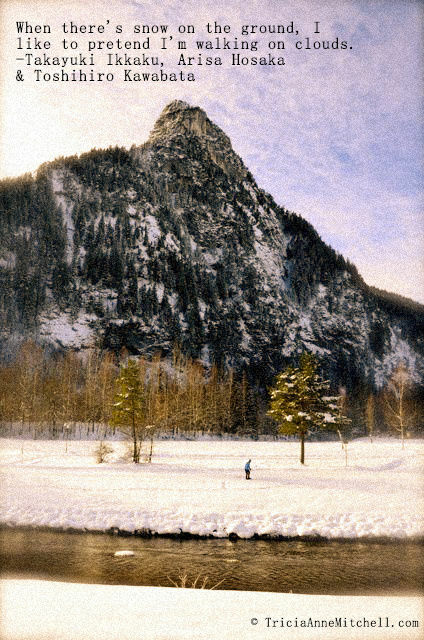 :) I’d love to give cross-country skiing a whirl, though, as it’s quite popular here. Thanks for your kind comment about my photographs, Elisa. This is a magical European spot indeed. Kat, how nice that some of the quotes made it into your collection. What a great idea you had to start that – a perfect place for one to head when seeking inspiration. I do feel as though we’ve come down with just a bit of cabin fever this season. I have visions of hiking here in warmer weather. I should embrace the cold weather and give cross country skiing a whirl in the meantime. Beautiful pictures and post. I needed this right now. I’m trying to plan a few days of excursions/activities in Brussels for February and am stymied by the cold weather. It definitely changes my itinerary. Usually, I’m happy to walk and wander for hours, but don’t think I will want to do that in the chilling cold and possible snow. So I need to rethink this. The quotes you included are helpful. I need to embrace it and enjoy Brussels in winter instead of wiching it were going to be warm. Juliann, how wonderful that the quotes helped you get past potential hibernation in Brussels. Have you been there before? It’s such a fun city; I’ve been there once in the winter and twice in summer. What excursions and activities are you considering? Hi Sid, thanks for your generous words. Having simplified for this sabbatical, we sold my car, so we’re now relying on our own feet to trudge through the snow and get us where we need to go. (European mass transit is also generally superb!) Even though there are times that I wish I had wheels, I’m pleased to not have to contend with winter driving (at least for this chapter of our lives). Drive safely out there. Thank you so much, dear Virginia! Has Vancouver been gifted with any elegant snowflakes this season? I think winters tend to be a bit milder there, right? A few days a snow drifted down and so delicately covered the fields. I tried to catch a few snowflakes. Something we would do as children. But the little darlings were to fine. There are tiny drifts of snow caught in grass on the North side of the house. The sun has come out and chased the rest away. We generally get at least one generous snow fall a winter. There may be more to come Tricia. Nope: i just run as far away from winter as i can afford to. But i’m glad that someone trudges it out. Especially when they are as talented as you with a camera. A most enjoyable post, Tricia. What a kind thing to say, thank you so much, Alessandro! You brought a smile to my face this afternoon. How often do you change venues? …I’m really enjoying your posts from Mexico. Such a great glimpse into everyday life! Winter here seems to be my favorite season because it brings such beautiful clouds and sunsets and is so changeable. I like all the seasons, but summer gets a bit monotonous. I feel fortunate that our winter rarely produces snow or really frigid temps. I’m feeling far too old to cope with winters like I experienced in times past in Boston or Utah. Thanks for your kind words, Judy! 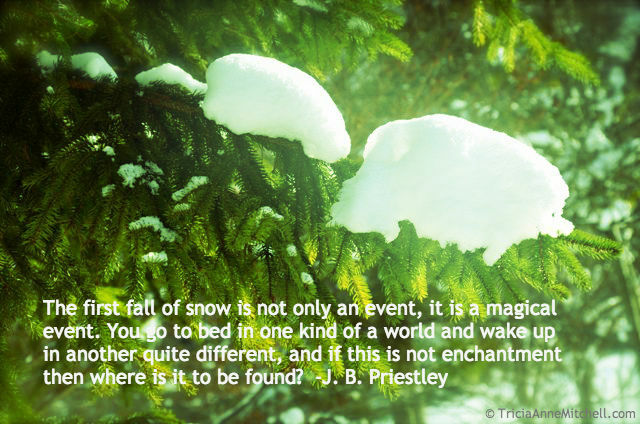 With a fresh delivery of snow today, I’m contemplating heading out with my camera again… we’ll see… :) I’m not sure what part of the States you are in – are you in a snowy wonderland? I use to live in a snowy area, Letchworth Park and Pulaski N.Y., regions. I live and work in Florida now. I have to travel for snow. Miss it!! I cannot wait to see more pictures of snow. Glorious!! Great set Tricia, I think i’m a winter person myself, although I do like a nice summer holiday, as long as there is a cold beer and pool close by. Mark, I’m surprised to hear that winter is so popular among the readers. :) In Germany, you’d certainly be happy with the plentiful amount of beer, though they do tend to serve it room-temperature here — something that American beer drinkers find to be a novel experience. Tricia, thank you for stopping and following my blog. 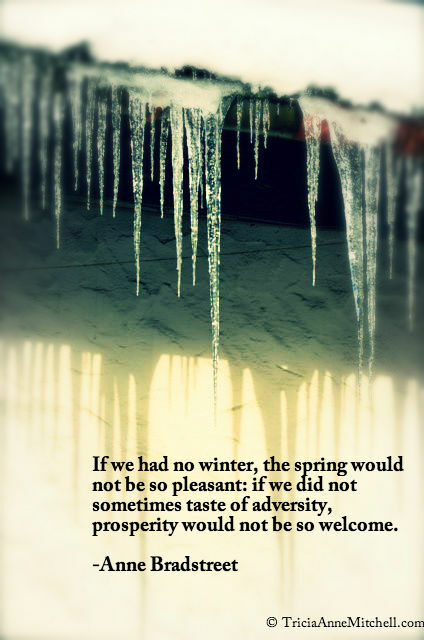 These are beautiful images and quotes that fit our day here in Alberta quite well. We got a few centimetres of snow overnight so it is a bit of a winter wonderland. I look forward to following your blog and travels. My pleasure, Ivon. 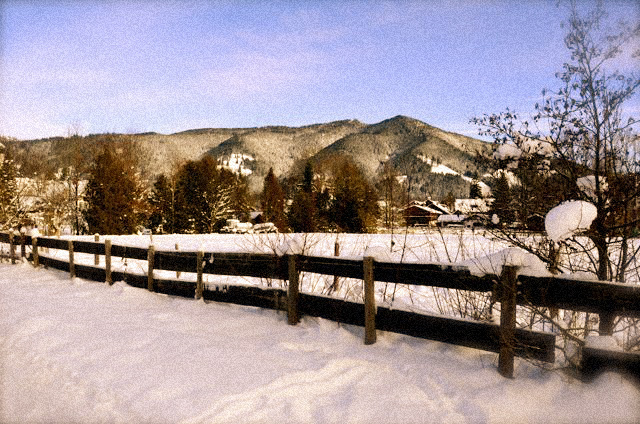 Hope you’re having a wonderful weekend in your respective winter wonderland! Wonderful, Tricia! You certainly capture the beauty of any scene. I’ve always enjoyed the changing seasons of the Midwest, but we are going south for a month!?!? Lucky you to chase some warmth this winter! Will you be heading to Florida, Linda? My aunt and uncle from IA are also wintering there. Tricia, this post is absolutely beautiful thank you for sharing. 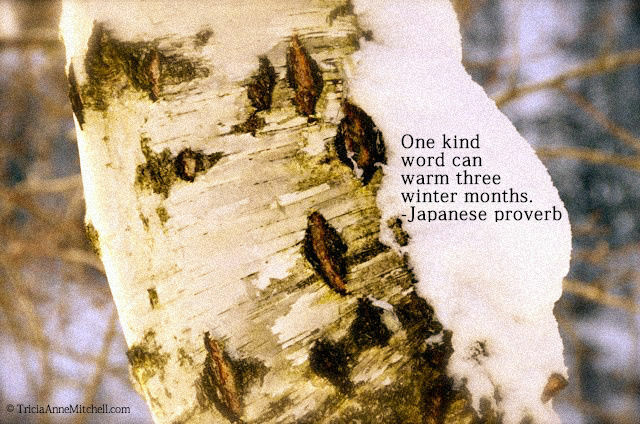 All those quotes with your images just speak to me, one of my fav is the Japanese proverb along with the image of a birtch bark, just so very Zen. Thanks, as always, for your kind comments and encouragement, Cornelia. 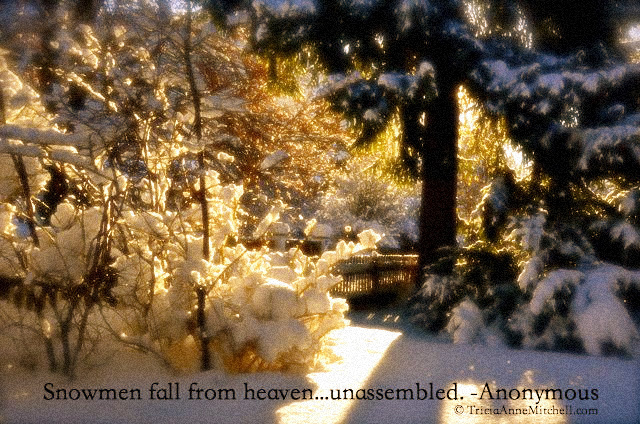 Snowmen fall from heaven- unassembled. That’s my favourite quote. 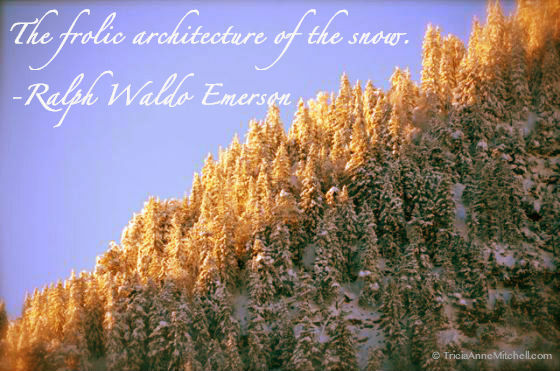 Aah beautiful winter shots and equally beautiful quotes Tricia! Those icicles are stunning! Stunning, but potentially dangerous! My husband had to slash one from my parents’ rooftop before it slashed someone passing by. Thank you for your kind comment, as always, Madhu. Enjoy the weekend. Thank you, Ease Your Travel. With Mother Nature’s help of course. :) Thank you, Ana Lucia. Have you been to this part of the world, Anyes? If we weren’t combining work with pleasure, I’d love to see even more of this beautiful region. For now, we’re loving having Trogir’s choir of bells and stone homes bearing crests as our work backdrop. Beautiful images and interesting words, Tricia. In Mexico City there’s no extreme climate changes during the year. In winter is colder but it doesn’t snow. 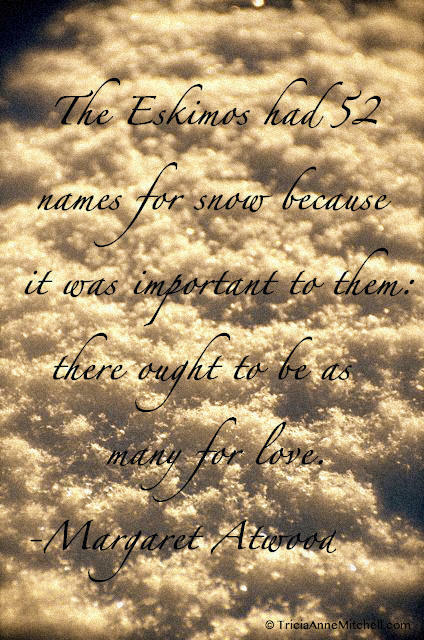 Although my mother told me that when she was a child, it snowed in Mexico City, only for one time ever, so it was a strange phenomena. I have never been in snowy places, and probably I will never be in one because I don’t like cold weather. By the way, thanks for following my blog “Exploring the world: Photography, travel, art” since February, I really appreciate it. Well if you come to Mexico City some day you can contact me. I can give you advice about interesting places to visit, and how to move around in the City.